RecruitBPM is a recruitment management software designed to help small to mid-sized hiring agencies streamline the recruiting process with a range of online tools including applicant tracking, social recruiting, a career portal, background screening, interview management, reports, and more. RecruitBPM is mobile-optimized, giving users the flexibility to access and manage contacts, job orders and candidates on the go via mobile devices. RecruitBPM enables users to manage all candidates and jobs conveniently on a single platform with resume and job management tools. Users can organize all jobs by skills, score and status, then match appropriate candidates to the new role. Resume parsing and advanced search functionality helps users identify relevant candidates based on particular keywords, skills, university, or location. RecruitBPM supports social recruiting, allowing users to post jobs directly to social channels like Facebook, LinkedIn and Twitter in order to engage a large number of candidates. Users can increase their reach further by posting jobs to business social channels and other job sites. Candidates can apply easily using their Facebook or LinkedIn profile. The CRM (customer relationship management) system enables users to manage their contacts and track any contact communication effectively. Calendar and scheduling tools allow users to organize and schedule an array of activities like meetings, notes, interviews and follow-ups, while email integration and bulk email templates serve to enhance interactions and routine communication. Users can post current job openings to multiple job boards and build customized company career pages using the RecruitBPM portal to post jobs by location and title. Recruiting analytics give users insight into recruitment performance, helping users to identify any inefficiencies and track improvements. RecruitBPM ensures sensitive data is managed safely and securely with role-based security, user management and customized access for hiring managers. Most affordable applicant tracking software loaded with features. simple and powerful to speed up hiring tasksOur company has tried several other tools for hiring purpose in past that were highly expensive offering basic features and few integrations. Another disadvantage was costly ongoing upgrades. On the contrary, RecruitBPM is a cloud-based recruiting solution that is very affordable with valuable features, integrations that are continuously improving. It allows us to publish job orders directly on the company's career page, many job boards and on social media channels such as LinkedIn, Facebook and Twitter. Most useful attributes for me are suggested candidates against a job order and email notifications that keep me notified about potential candidates for the open jobs. Our company has tried several other tools for hiring purpose in past that were highly expensive offering basic features and few integrations. Another disadvantage was costly ongoing upgrades. On the contrary, RecruitBPM is a cloud-based recruiting solution that is very affordable with valuable features, integrations that are continuously improving. It allows us to publish job orders directly on the company's career page, many job boards and on social media channels such as LinkedIn, Facebook and Twitter. Most useful attributes for me are suggested candidates against a job order and email notifications that keep me notified about potential candidates for the open jobs. I really like to have live video interview ability in this software to let us screen the candidates more easily. Besides, whenever I got stuck in handling the application, I found customer care very helpful. Highly functional applicant tracking software with a lot of capabilities, integrations and features. I feel very comfortable to use this tool as it gives complete freedom to customize not only work flows but also allows to add custom fields in any module of the application. Search functionality provides thorough probing of data and most relevant results which saves my time and let me submit better suited applicants. Additionally, reporting capability of this tool allows to monitor recruiting data for performance and goal rate analysis. You can also track email engagement with candidates through activity log and know about which time is better to have a conversation with them. All these aspects help me immensely to achieve my goals and plan for my future projects. Although there are no significant complaints about RecruitBPM. But still want reporting to be more customizable so we can add more metrics to measure the overall recruiting process needs. All in all it's a wonderful experience of getting the whole hiring process simplified in such a little cost. RecruitBPM applicant tracking is one of the best tools in the market. It’s not only valuable to make recruiting tasks easier but also let us automate recruiting in very low budget. The tool has a great way to organize, manage and track candidates from the job applications to the placement phase. Most handy aspect of this tool is being user-friendly. Another value adding feature is integrations with social media and job boards which makes searching, referring and driving candidates to our recruiting platform. RecruitBPM applicant tracking is one of the best tools in the market. It’s not only valuable to make recruiting tasks easier but also let us automate recruiting in very low budget. The tool has a great way to organize, manage and track candidates from the job applications to the placement phase. Most handy aspect of this tool is being user-friendly. Another value adding feature is integrations with social media and job boards which makes searching, referring and driving candidates to our recruiting platform. RecruitBPM helped us to organize the recruitment process and get tasks done in a stress-free manner. It has significantly improved the success rate of our recruitment efforts since last 3 years. Seamless integration of multiple job boards with this application enable us to send job posting to several free job boards with few clicks, save hours of manual job posting on each website. We can source candidates from multiple resources, track the potential candidates, screen applicants and complete smooth on-boarding through a single platform. This tool increased communication level among our managers and recruiters which reduced the hiring time-frame and enhanced team performance. It seems that RecruitBPM team is constantly improving the system and adding more advanced features. The issues I faced a few weeks back are resolved and I can’t find anything problematic right now. RecruitBPM is highly efficient recruiting solution and has been facilitating us to be done with most of our important and time-consuming recruiting tasks quickly. It also allows us to automate the hiring process. The tools and features in this applicant tracking software are very useful and facilitating. 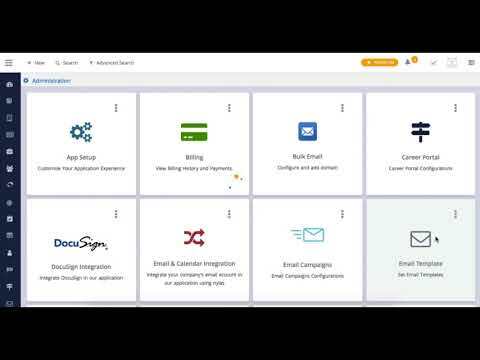 One of the best things I like about RecruitBPM are the integrations it has with RingCentral for calls and SMS tracking, email and campaigns’ tracking with Mailgun. These integrations save a lot of our time whether it’s to call a candidate or to send emails in bulk. Moreover, the storm search feature of this product let us find the most suitable candidates for particular job positions in less time. One of the best things I like about RecruitBPM are the integrations it has with RingCentral for calls and SMS tracking, email and campaigns’ tracking with Mailgun. These integrations save a lot of our time whether it’s to call a candidate or to send emails in bulk. Moreover, the storm search feature of this product let us find the most suitable candidates for particular job positions in less time. I would like this recruiting software to add multiple e-Signatures integrations. Manage the entire candidate lifecycle, from resume receival to sorting, evaluation, and placement, all from the same location. Social recruiting tools help users reach a wider candidate pool by posting jobs directly onto social channels like Facebook, LinkedIn and Twitter. Multiple interactive dashboards and graphical reports and analytics give users real-time insight into recruitment performance, helping users to identify and work on any areas for improvement. RecruitBPM is mobile-optimized to support mobile recruiting, allowing users to access and manage candidate and job information anytime, anywhere. Customized security access allows users to maintain different levels of access for different users and ensure data confidentiality. Below are some frequently asked questions for RecruitBPM. Q. What type of pricing plans does RecruitBPM offer? Q. Who are the typical users of RecruitBPM? Q. What languages does RecruitBPM support? Q. Does RecruitBPM support mobile devices? Q. Does RecruitBPM offer an API? Yes, RecruitBPM has an API available for use. Q. What other apps does RecruitBPM integrate with? Q. What level of support does RecruitBPM offer?